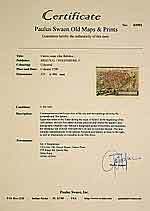 Size: 5.0 x 6.8 inches. Condition: Wood block print with letterpress. Paper slightly browned and spotted. A rare Swedish edition of this somewhat curious map of Europe, Africa, and Asia is to be found in apocalyptic literature originally emanating from Wittenberg in 1530 or even 1529. The map was first used by the printer Hans Luft to illustrate two works: one a commentary on the prophet Daniel by Martin Luther (1530) and another linking the vision of Daniel with the assaults of the Turks on the perimeters of Christian Europe at the time. 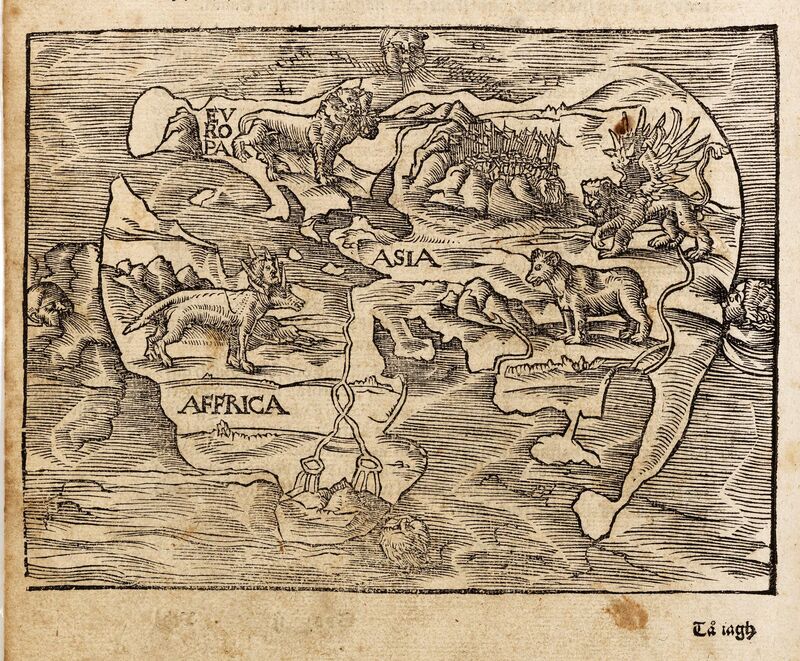 The wood cut map is showing the four beasts of Daniel's Dream Map. According to Ernst Gallner this is the first version and second wood block and only printed in Uppsala. The map is printed on a a larger sheet (295x193mm. ), on verso of page CIIII. The page is attached to CVII. Included in "Biblia, Thet är All then Helgha Scrifft, på Swensko." This Swedish Bible is the first containing the entire text and the only complete Bible printed in Sweden in the 16th century. The translation is based on the Luther Bibles of 1523 and 1534 and was made under the direct supervision of the Swedish reformers, Laurentius Petri and Olavus Petri, who in this work laid the foundation of the modern Swedish language. Their text was used, with small alterations, in numerous editions up to the beginning of the 19th century. The printing of this Bible, which was the largest typographical undertaken of the century, had to be entrusted to a foreign printer, Georg Richoff of Lubeck, who was invited to Uppsala. The Vasa-Bible contains further the FIRST PRINTED MAP IN SWEDEN, the map was printed on Folio 104 verso (in Der Prophet Daniel). and is only known from the Vasa-Bible. The Wittenberg World Map, more commonly known in English as Daniel’s Dream Map, is probably the most mystical world map of all time. At the time of its first publication as the sixty-first world map to go into print, it was, on the one hand, a depiction of the Old World, based on the Ptolemaic world view but including a number of recent Spanish and Portuguese discoveries, but on the other, a visualisation of the prophet Daniel’s apocalyptic dream of the four kingdoms. There are fourteen different versions of Daniel’s Dream Map, with twenty printing blocks. All the versions are produced in woodcut technique. Read more at Ernest Gallner's most interesting essay on Daniel's Dream map. See also a version by Jost Amman.